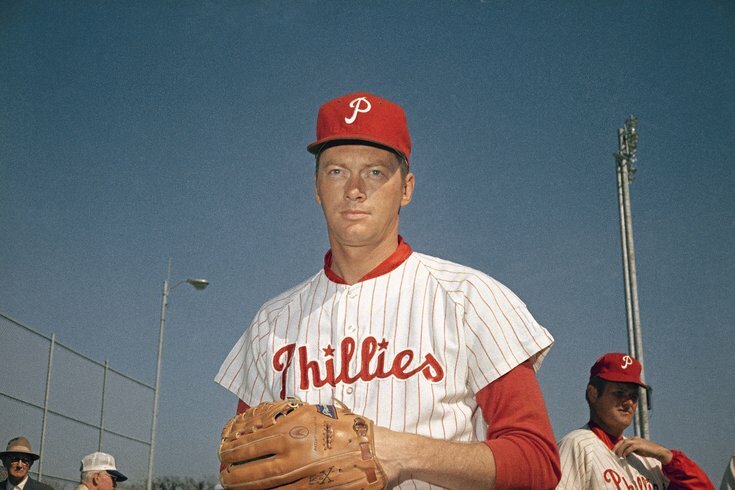 Jim Bunning went 224-184 with a 3.27 ERA in 591 career games between 1955 and 1971. Jim Bunning, a former U.S. senator and one of five Hall of Fame Phillies to have his number retired by the team, passed away on Friday night due to complications from a stroke he suffered in October, the Phillies announced on Saturday afternoon. Bunning was 85. The Kentucky-born right-hander won 89 games in six seasons with the team, representing the Phillies in two All-Star games and finishing second for the National League Cy Young Award in 1967. He was the first modern day pitcher to win 100 games in both the American and National Leagues. Bunning was a nine-time All-Star who was inducted into the National Baseball Hall of Fame by the veterans committee in 1996. In his first season with the Phillies, in 1964, Bunning pitched the seventh perfect game in baseball history on Father’s Day against the New York Mets at Shea Stadium. Six years later in 1970, a 24-year-old rookie shortstop named Larry Bowa tutored under the no-nonsense veteran pitcher, who was in his final season with the Phillies. At the time, Bowa said he didn't know whether he'd even last a month in the major leagues, but it was Bunning's words that resonated with him then, throughout his own 16-year career, and even today as a coach, too. "I never had a pitcher mentor me like he did in one year. In spring training he told me, ‘Keep your mouth shut and your eyes and ears open.’ It was that simple. I said, ‘Yessir,’" the 71-year-old Bowa, the current Phillies bench coach, said Saturday afternoon at Citizens Bank Park. "He was all for energy and never quitting. He said ‘I’ve been out there where I’ve given up 6 runs and I don’t quit. I don’t ever want to see you quit. Because you bring a lot to the table with your energy and desire to play.’ Like I said, pitchers, I got along with pitchers, but they never took the time to say something to me, and that was my first year. All that stuff stayed with me. "I had that energy level all the time with my dad, the ‘don’t quit.’ But to have it reinforced by (a future Hall of Famer), I can’t even express in words what that meant. When a guy like that takes the time with someone who is just starting, it’s, I mean, it resonated throughout my career." After his baseball career ended following a 17-year run with the Phillies, Detroit Tigers, Pittsburgh Pirates, and Los Angeles Dodgers, Bunning returned to Kentucky and began his second life as a politician. He served as a United States Senator from 1999 to 2011. The Phillies acquired Bunning from Detroit along with catcher Gus Triandos for outfielder Don Demeter and pitcher Jack Hamilton on Dec. 5, 1963. Bunning's No.14 is painted along a brick wall at Ashburn Alley at Citizens Bank Park between Mike Schmidt's No.20 and Richie Ashburn's No.1. The Phillies placed a black drape above the number prior to Saturday afternoon's game against the Cincinnati Reds. Bunning is survived by Mary, his wife of 65 yeas, along with nine children and 35 grandchildren. According to the Phillies, visitation will be held at Muehlenkamp-Erschell Funeral Home in Fort Thomas, Ky. on Friday, June 2 from 2:00-8:00 p.m. EDT and a mass of Christian burial is set for Saturday, June 3 at 10:00 a.m. at the Cathedral Basilica of the Assumption in Covington, Ky.